Soooooo, I'm kind of addicted to this dip right now. The flavor is to-die-for. It has a great green chile cheesy flavor that leaves a tiny bit of heat on the tongue. I could eat dips for breakfast, lunch and dinner, so I needed a skinnier recipe. This recipe uses 1/3-less fat cream cheese and Greek yogurt instead of sour cream or Mayo. With the brands that I used - one cup of non-fat plain Greek yogurt has only 120 calories. The same amount of sour cream has 480 calories. That is saving 360 calories right there. I also use a pre-shredded Italian Cheese blend that gives a great cheesy flavor and you are able to add less cheese. No one will have any idea this has a fraction of the calories as other recipes. It does have a slightly different texture than a smooth dip, but I love it. It's amazing warm, right out of the oven and it's amazing at room temperature. It even tastes really good re-heated for a few days. 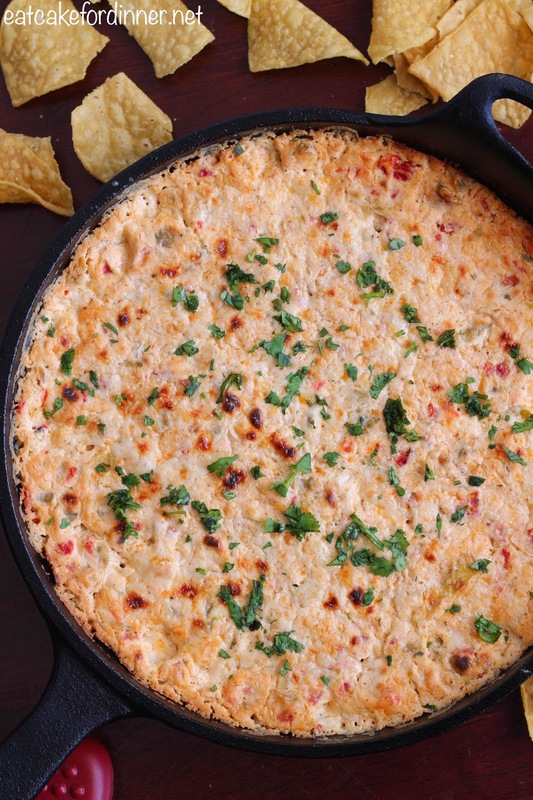 You can serve it with tortilla chips, baked tortilla chips, crackers, vegetables or whatever else you can think of. Preheat oven to 350 degrees. In a medium bowl, stir together cream cheese, yogurt, diced green chiles, chopped roasted red peppers, cumin, garlic powder, chili powder, onion powder, pepper and Italian cheese blend. Spread into a medium cast-iron skillet or an 8x8-inch baking dish that has been sprayed with cooking spray. Bake for 30 minutes or until hot and bubbly. 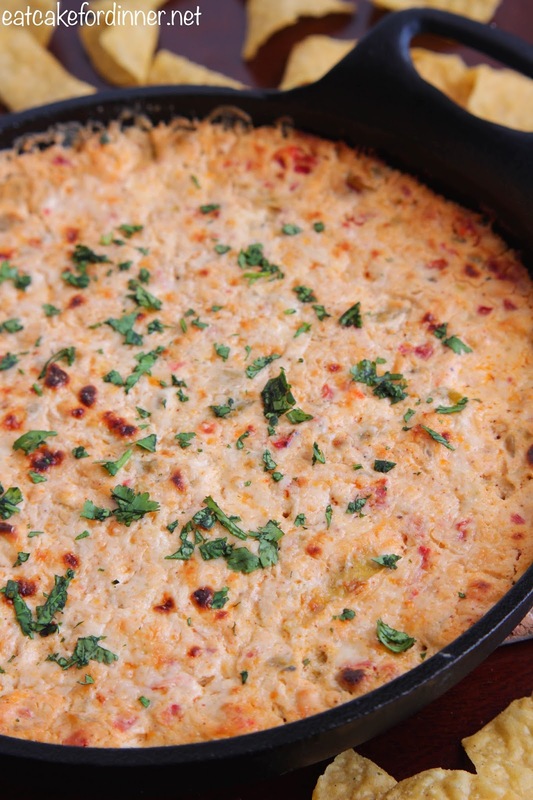 Remove from oven and top with grated Asiago cheese. Return to oven and broil for a few minutes or until cheese it slightly browned and bubbly. Garnish with chopped cilantro, if desired. 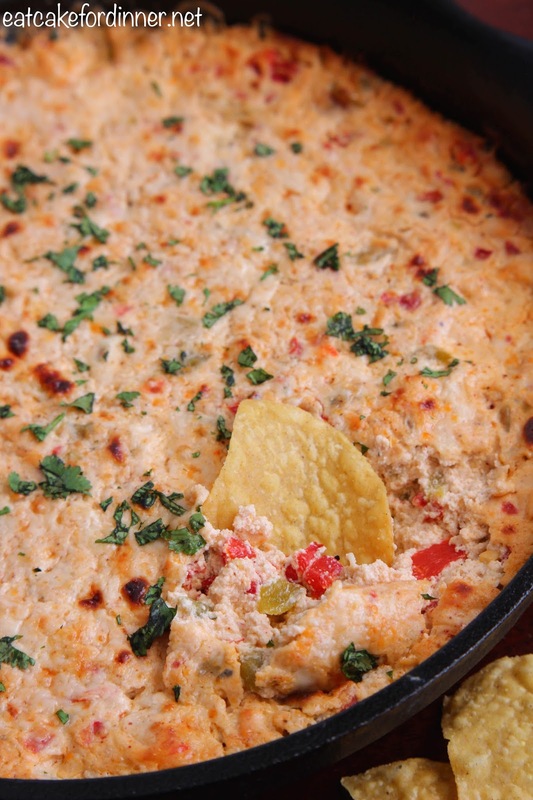 Serve with tortilla chips, crackers or veggies.